Marengo Iowa Feb 7th 1865 Tuesday forenoon Dear Brother Jim It is with much pleasure I sit down to answer your letter of Jan 7th which was rec'd one day last week. I do not know which as I was away from home visiting all last week did not get home until Saturday evening. 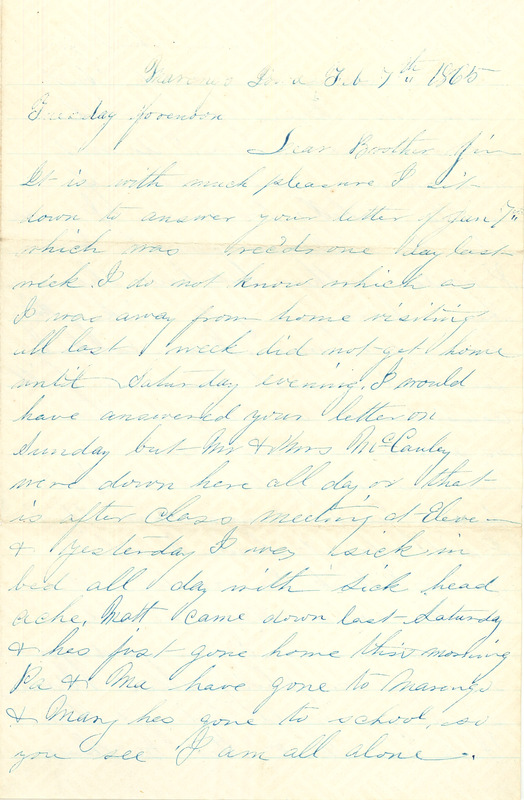 I would have answered your letter on Sunday but Mr & Mrs McCauley were down here all day as that is after class meeting at Eleve - & yesterday I was very sick in bed all day with sick head ache. Matt came down last Saturday & has just gone home this morning Pa + Ma have gone to Marengo + Mary has gone to school, so you see I am all alone.